Economey Djembe :Money Saver for Music Lovers Bring the rhythm of Africa to life with these miniature d'jembe drums from Burkina Faso and Senegal. These are exceptional home decorations and great for kids. 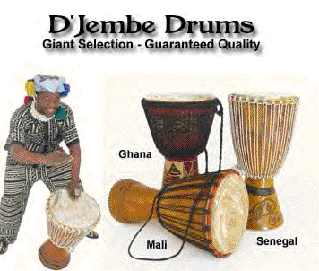 Djembe Drum - small size. Drums are a traditional African musical instrument. The entire instrument is hand made. The drum surface is leather made from animal hide/skin and the base is Lenke wood found only in Sub Saharan Africa, with leather top. Made in Mali, Madagascar, and Senegal. Drums are a traditional African musical instrument, and this entire instrument is handmade. The drum surface is animal hide/skin, and the base is made of sturdy carved Lenke wood found only in Sub Saharan Africa, with leather top. Made in Mali, Madagascar, and Senegal. Full Size Djembe Drum. 23" tall with top 14" in diameter; and constructed of Lenke wood found only in Sub Saharan Africa, with leather top. Made in Mali, Madagascar, and Senegal. Designs and construction may vary from that shown. Bring the life and joy of music into your home with this Animal hide drum. Designed and hand-crafted into one stunning instrument or home decoration. Sure to catch the eye. skin head overlaid with Egyptian motif. Design May Vary 12" X 7.5"
Give your music an exclusive African flavor with new disk drums. Drum is made with a 9" goatskin head to add depth to your tone, and comes with a curved mallet. Make a fervent impression with an authentic Egyptian tambourine. Leather and mother of pearl combine to create a fabulous work of visual art. Bring out the true sounds of Northern Africa .